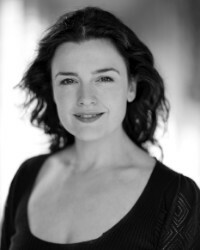 Dianne trained at Guildford School of Acting. (Vaudeville Theatre); Amalia in She Loves Me (Minerva Theatre, Chichester); Pamela/Margaret/Annabella in The 39 Steps (Criterion Theatre); Glinda in Wicked (Apollo Victoria Theatre); Grizabella in Cats (National Tour); Belinda in The Far Pavilions (Shaftesbury Theatre); Mary in Tonight’s the Night (Victoria Palace); Belle in Disney's Beauty and the Beast (National Tour), Kim in the original cast of Boy George’s Taboo; the title role in Snow White and the Seven Dwarfs (Victoria Palace); Protestant Girl in The Beautiful Game (Cambridge Theatre); The Beggar Woman in Sweeney Todd (Bridewell Theatre); Marion in Tess (Savoy Theatre); understudied and played Fantine and Cosette in Les Miserables (Palace Theatre). Workshop credits include: She Devil! directed by Simon Phillips; The Magician's Elephant (RSC); Unsuitable for Adults directed by Nigel Planer; Radical Thinking; Bubonic (ATG); Ghost Map (NT Studio); Catch Me If You Can (ATG); The Little Prince; Pride and Prejudice directed by Laurie Sansom; Alvaro's Balcony; Love Never Dies directed by Jack O’Brien; Urinetown directed by John Rando; Dr Zhivago directed by Des McAnuff; Helen of Troy directed by Gary Griffin; Charlotte - Life or Theatre?. Original Cast Recordings include: Young Frankenstein; Taboo; The Beautiful Game. Film credits include: A Very Personal Assistant; Les Miserables (Working Title Films) directed by Tom Hooper; The Wolf Man (Universal Pictures) opposite Benecio Del Toro. Dianne's debut solo album Little Stories was released in December 2010. Most recently: Elizabeth Benning in Mel Brooks' Young Frankenstein (Garrick Theatre) directed by Susan Stroman.